Times: 7:00 pm. to 9:00 pm. This is a limited size class – Your Reservation is Required Adele Marie is opening her doors once again for Mediumship Development classes. This is a series of 9 weekly classes offered on Monday Nights. Monday 7:00 pm. to 9:00 pm. Due to the high demand of individuals seeking to be apart of Adele Marie’s weekly Mediumship & Spiritual Classes, Adele Marie has been guided to open her doors once again just for you. This course is an intensive hands-on development classes working with Adele Marie and her Angelic Wise Ones® Teachers as they walk and guide you through all that you need in your Mediumship development. This Mediumship Development is a series of 9 weekly classes taught by one of Adele Marie’s teachers that will include every facet of learning as they walk you through your higher learning of the Spiritual realms. Adele Marie will be available in this series of classes. REGISTRATION A MUST- TO REGISTER: Thank you! These classes are fun and informative and will definitely change your life in a loving way, not only with yourself, but also, with all things in and around your life. Learning to work with Spirit in a safe, loving protected environment that you cannot find anywhere else.. Find out the do’s and don’ts, truths and myths of the metaphysical world as you bring your awareness to a whole new level of consciousness. Adele Marie being the original creator of numerous Guided Meditation CD’s in meeting your Spirit Guides, Angels and Teachers will guide in person through a series of meditations to meet your Spiritual Team who work with you each day. To the use of Angel Oracle Cards – as you learn how to give Angel readings, to the use of Psychometry of material objects and paper, to stand up platform messages in the advance classes. Meeting your guides, Angels and teachers in Spirit can be the most life changing event for you as Adele opens these doors as no one else can. Adele walks and guides you through every facet you need as your spiritual growth ascends to an energy level of total alignment with your souls purpose. Adele gives you more in her teachings than what you will not find anywhere else. Everything she teaches you is what she herself lives each day as she personally walks you into receiving the divine that is in each of us. Caring and sharing our work together in a platform that has never been seen before. As a Teacher of Teachers Adele guides you into these coming times to give you peace and comfort in knowing who you are and what is going on in your life is exactly what you have been asking and now you have the way to find the answers to what you are looking for. Note: Due to the limited size of this class to keep it very intimate once class begins there is no refund as you have registered and reserved this space for you. Adele Marie’s teachings come at a time in history when we are moving at and in a very accelerated force of energy that is designed to enlighten and move the individual forward in the light to their own ascension. Here Adele will teach you the tools and techniques to awaken you as you travel your spiritual journey and the ongoing reality of the spiritual realms of communications in your life. To guide and teach you as the Blessed Mother is stepping forward at this time for each of us, to connect with her energies of Divine Love, which is available to you each and every day in all you do. Bringing you to profound awareness of the divine love, wisdom and peace within you. Accessing the information, that will transform and benefit your whole life. Are you ready to be empowered to make conscious life decisions and live in total alignment with your soul’s purpose every day? These courses are designed to bring you to that fulfillment as you learn from the basic foundation up to your ascension. Adele’s Marian style of learning is what everyone is talking about in her Development Classes and Workshops. 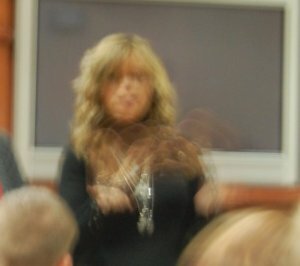 Adele is available for Speaking Engagements and Seminars in your area on topics about Mediumship, Spirituality, Teaching, Lecturing and Book Signings. Adele Marie conducts private workshops, seminars or classes with your group in your local areas Across the Miles.